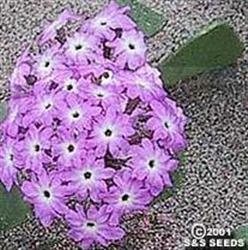 Abronia Maritima has brilliant pink flowers that stand out against the sandy soil that the plant thrives in. This plant has light green, fleshy leaves. It's a great soil stabilizer as demonstrated by its habit of growing in coastal dunes. The plant tolerates salt spray but doesn't like regular water nor extreme drought. The soil the plant grows best in is fairly loose soil that doesn't have debris mixed in with it.